Apple has temporarily stopped offering the iOS 9.3 update for older devices like the iPad Air and earlier and the iPhone 5s and earlier due to installation issues some users have experienced. On older devices, iOS 9.3 requires users to input the Apple ID and password originally used to set up the device, which can lead to the device becoming stuck at the Activation Lock screen if the original account information can't be recalled. In a statement given to iMore, Apple says it is working on a fix and plans to issue a new version of iOS 9.3 in the next few days. Customers with an affected device who attempt to download iOS 9.3 during this time will not be able to install the update as Apple has stopped signing it. Updating some iOS devices (iPhone 5s and earlier and iPad Air and earlier) to iOS 9.3 can require entering the Apple ID and password used to set up the device in order to complete the software update," an Apple spokesperson told iMore. "In some cases, if customers do not recall their password, their device will remain in an inactivated state until they can recover or reset their password. For these older devices, we have temporarily pulled back the update and will release an updated version of iOS 9.3 in the next few days that does not require this step." For customers who have already installed iOS 9.3 and have gotten stuck at the Activation Lock, Apple has published a support document with steps on how to solve the issue. 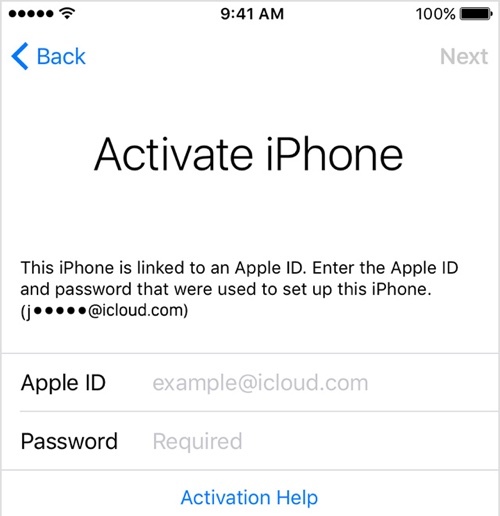 Apple recommends removing Activation Lock via iCloud or attempting to enter an Apple ID or password through iTunes. Update: Apple has released a new build of iOS 9.3 for the iPad 2 and may be planning to roll out updates for additional devices. Apple has not yet resumed signing iOS 9.3 for affected devices. This is starting to become the norm. Issues with every single update, no matter how big or small. Wait, an iPad Air is considered an older device??? Apple strategy to force upgrade to iPhone SE/iPad Pro. We're not perfect like you. Amazed with the amount of people in this topic who are fast to blame "silly users forgetting their passwords" but are unable to read the few lines of the announcement or understand what they read. OK, let the words "Apple ID and password used to set up the device" be not very clear. "In some cases, the hint that you see on the Activate iPhone screen might not match your current Apple ID." And the rest of it is definitely written not for those who "forget their passwords", but for those who are still able to log in to the iCloud. You may fuel you feeling of superiority over the fellow users as much as you wish by thinking you are far more clever. But just logically, in case something really serious prevented you from reading the news or following the link to the Apple site before posting here: do you think Apple is also that stupid, that it would go into all the hassle instead of just telling people "here is the link to change the forgotten password, follow the steps", if the case was with people not remembering their current iCloud passwords? It's a good security practice to change your passwords from time to time. And there is nothing wrong in changing the primary email used to sign in to the iCloud as well. And I've never seen any advisory to keep the list of the old emails and passwords just in case. The fault lies with Apple and the bug in their software. Apple acknowledged it and is making an effort to fix it. Not sure what logic you're using to shift the blame to the consumer when Apple already said "my bad". The logic is Apple is never wrong and if something goes haywire it is always the end users fault. We have had ample evidence of this outlook on here for many years. Maybe I'm missing something.. It seems unnecessary to receive these prompts after updates. But do people not know their Apple ID password?? I would imagine this would be an issue for people that bought a used device. Obviously would not know the password used to originally set it up.